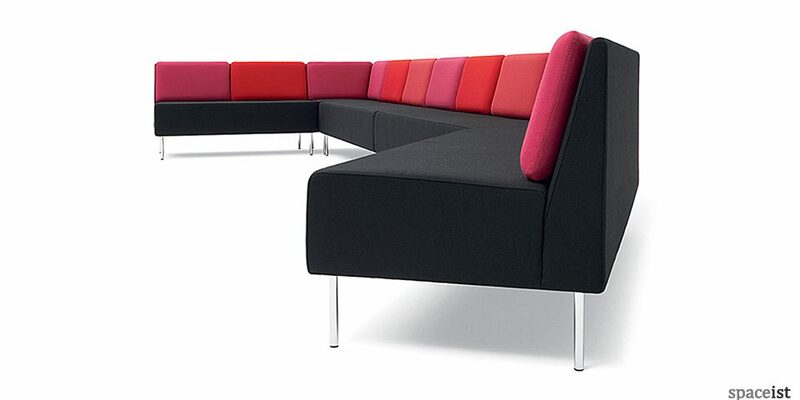 For a modest yet colourful and attractive sofa for the office, the NEW Play modular sofa is now available in a range of fabric and leather colours. There are three colour ranges, each with nearly over 60 shades to select from. The wooden framed sofa with foam covered in the fabric or leather option comes with four base leg options too; chrome, silver, black or white. We have shown here how you can choose a range of multiple shades to suit your interior colour branding. Pictured is also one of the many angle configurations that are possible for the corners. The Play modular sofa lets you create a playful and individual piece each time.